I used clear contact paper to “laminate” the roads so they wouldn’t get bent in our game. AND it’s great to practice counting & numbers too! Spotted on Little Family Fun. Click here for link. With enough room, this game can easily be played inside. One person is the traffic light at one end, and the other players are at the other end. When the traffic light faces the group, he or she says, “Red light!” and everyone must freeze. The traffic light then turns his or her back and says, “Green light!” while the group tries to get as close to the traffic light as possible. The traffic light turns around quickly, again saying, “Red light!”, and if anyone is spotted moving, they have to go back to the starting place. The first person to tag the traffic light wins and gets to be the next traffic light. Spotted on Wired. Click here for link. Horse is a great game for young and old since it requires shooting skill rather than stamina and athleticism. Any child who is old enough to sink a basket can play. One basketball goal and a basketball are required. You can play wherever there is a basketball goal. Players line up. The first player announces what shot he is going to make and takes his shot. If he misses, he goes to the end of the line. If he makes the basket, the next player must make the same shot. If the second player misses, he gets an “H,” and it is the next player’s turn to announce a shot and try to make it. Each time a player fails to make a shot that his predecessor made, he gets another letter until someone has spelled “horse.” At that point the player is out. The other players continue play until only one player is left. If there are large differences in height, you may want to outlaw the dunk shot. Some players allow the player who has received the “E” one more shot to try to stay in the game. If longer or shorter games are desired, different words can be spelled. Spotted on Classic Kids Outdoor Games. Click here for link. Moos and oinks fill the air as players race to find their fellow animals in this hilariously noisy menagerie matchup. At “Go,” each player belts out his or her animal’s sound (a goat’s bleat or a chicken’s squawk, for example) and runs to find other players making the same noise. The first group to herd itself together and sit down wins. After a few rounds, mix it up with animals found in a zoo, jungle, or pet shop so that players can make different sounds. Spotted on Family Fun. Click here for link. Use a utility knife to cut a one-gallon plastic jug in half horizontally. Recycle the bottom half of the jug, but save the top half (the half with the handle). If you like, cover the cut edge of the jug with duct tape. 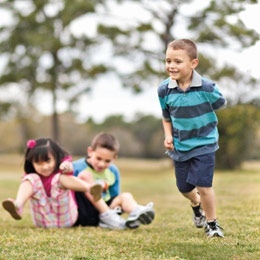 Two or more children playing together can use the jugs to toss a tennis ball or beanbag back and forth without touching it with their hands. 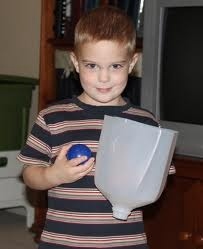 child playing alone can toss a ball or beanbag in the air and catch it in his jug, seeing how many successful catches he can make in a row. Spotted on Family Education. Click here for link. Split up into two teams. Each team lines up on one side of a small soccer field, with goals at either end. The goals can be proper goals or two chairs; The field can be any size – it depends on the size of your group but it can be half the size of a basketball court. Players on both teams are assigned a number, starting at “1” on each team. Put the soccer ball in the very middle of the field, then have the umpire call out a number. The team members who have been assigned the number crab walk to the centre and try and kick the soccer ball through for a goal. When a goal is scored, return the ball to the centre and start again. If the ball gets stuck or kids are taking too long, call another number and the original pair return to the line. Spotted on Youth Group Games. Click here for link.